This blog is created to check the browser compatibility for HTML element and CSS classes. We know sometimes due to browser compatibility and support our HTML, CSS or other page doesn't work as we expect. Sometimes it creates a bad impression with the client and users about our web application. So, it is always good to know whether our HTML elements and CSS classes are compatible and supported by different browsers or not. To get the solution to this problem let's get started now with the following steps. Open the website Can I use. It will look like as shown in below image. 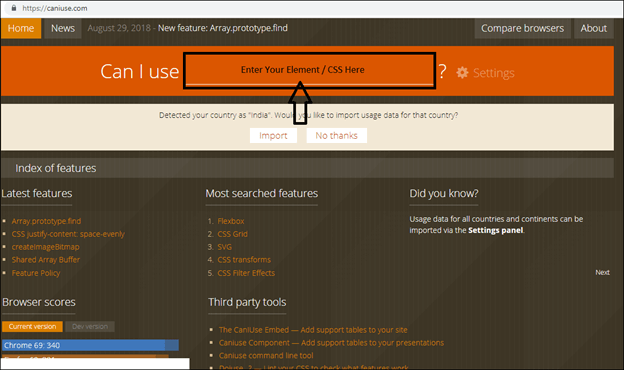 Now here you need to insert your HTML element or CSS class name in the textbox as indicated by the arrow sign to check for the browser compatibility and support percentage. It will display the result with all browser's support in table format as shown in the below image. As we can see in the above image, the result in the format of the table has displayed that the HTML element table is supported. So, we can use it without any restrictions. 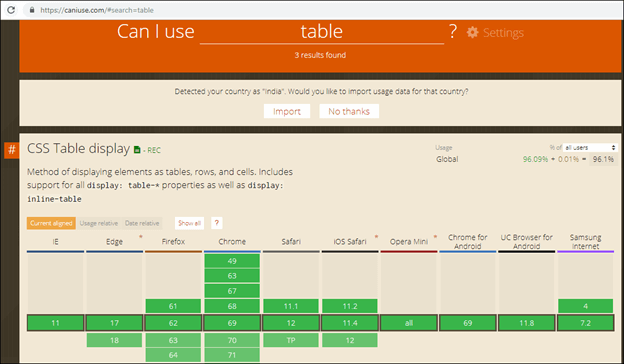 Once you mouse over on the table cell as shown in the above image it gives the details of browser support information: browser version, released date, and global usage as shown in the below image. It gives the subset of all related elements which can be used with a searched element as shown below. It gives the details of known issues with browser name which come generally with a searched element as shown in the below image. It gives the link of documentation for the searched elements as shown in the below image. Now as per the result displayed you can make a further decision as to whether you can use that searched element in your website or web application, as you already know for which browsers you have developed your website. In this blog, we have learned how to check the browser compatibility of HTML elements and CSS class. I hope you learned and enjoyed it. I look forward to seeing your feedback.